Tofu is a model base to cook with because it takes on any flavor you work with. Why not infuse this protein-rich base with your favorite kind of tea? This recipe calls for black tea, flavoring the classic with soy sauce, ginger, and garlic cloves to create a marinade for your tofu to sit in for at least an hour, and ideally overnight. Once the tofu’s soaked up this tea marinade, pop it in the oven. 25 to 30 minutes later, you have a healthy, flavorful treat. 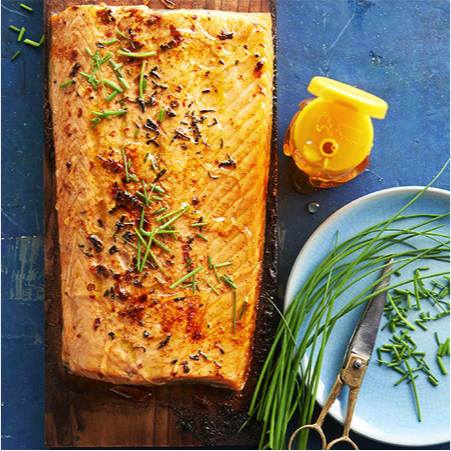 Start by boiling jasmine tea to follow this delicious salmon recipe. Add chipotle pepper, vinegar, salt, and ice cubes to the tea in a blender, then pour over salmon and marinate in the refrigerator for 30 to 45 minutes. Before grilling, season your fish with chili powder and jasmine tea leaves. Once it’s off the grill, add some chives and honey for a final garnish, and you’ve got one impressive meal to serve. This recipe uses mustard, traditionally a condiment, and tea, usually a beverage, as atypical bases in this marinade that’s great on steak. Begin with green tea and whisk in both stone ground mustard and Dijon, as well as oregano, marjoram, and olive oil. Add your meat, and marinate for up to 24 hours for a unique dish that’s sure to dazzle carnivores. Iced tea becomes an ingredient in this chicken dish that’s perfect for your summertime barbecue. Kick your marinade off with unsweetened iced tea and add lemon juice, garlic cloves, honey, olive oil, salt, black pepper, and rosemary. Add your chicken and marinate for eight hours until throwing it on the grill and making your guests very happy. This recipe marinates pork chops in sweet tea for at least six hours before using it as the base of a delectable sandwich. After spending some quality time in the refrigerator, the tea-soaked meat is dipped in milk and then fried in flour, pepper, salt, and garlic. Once cooked, it’s topped with veggies and lovingly sandwiched between two buns.